DBV is an open source and PHP-powered application that can help us include databases in to the version control system we are using. Once installed, it tracks each schema/record change (tables, rows, columns, views, functions, etc.) and allows us to export a SQL file reflecting the change. 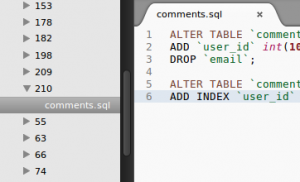 DBV supports MySQL by default and has a simple interface to implement connectors for any other databases.